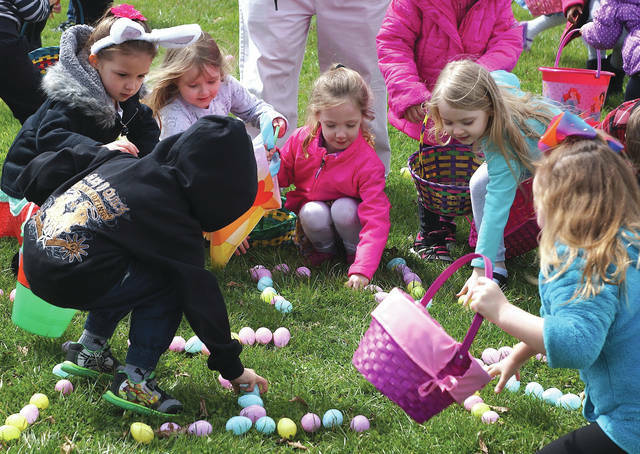 File photo The horn will sound at 2 p.m. Sunday, April 21, signaling the children to begin the egg hunt, at Central Park, 222 S. Central Ave.
FAIRBORN — Local children are invited to hunt some of the 10,000 eggs that will be scattered and hidden across a local park for The 50th Annual Fairborn Community Easter Egg Hunt. Varying categories will be offered — ages 1-3, ages 4-6 and ages 7-10. Children with special needs will also have a designated space to hunt eggs, a new addition this year. 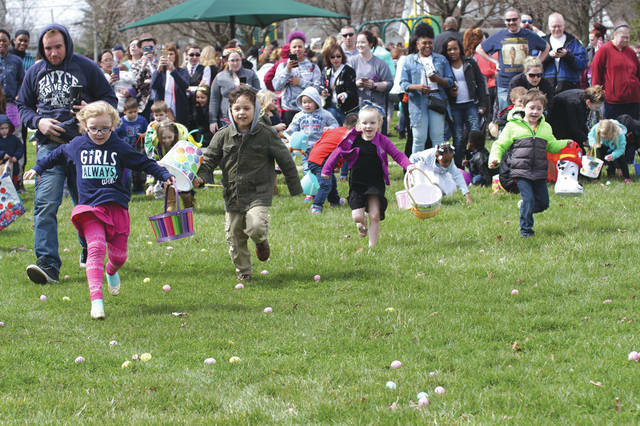 Some eggs will contain numbered labels, indicating that the egg hunters have won a special prize — which could be something as small as a .50 cent piece, or as exciting as a bike or necklace donated by Shwartz Jewelry of Fairborn. After the hunt concludes, children are invited to head inside the Fairborn YMCA to pickup their prizes and get their photo taken with the Easter bunny. The 10,000 eggs will be stuffed in the days before the hunt by local volunteers and Wright-Patterson Air Force Base airmen. Owen said he enjoys the camaraderie between the airmen, volunteers and chamber ambassadors. Owen pointed out that some of the airmen cannot go home for the holiday because their families live far away from where they are stationed at WPAFB. He added that some egg hunters will also choose to take photos with the airmen instead of the Easter bunny. The Fairborn Area Chamber of Commerce is accepting monetary and candy donations to support the hunt. If individuals choose to contribute candy, they are asked to give hard candy instead of chocolate candy as the chocolate will melt inside the egg. To make a donation, contact the Fairborn Area Chamber of Commerce at 937-878-3191 or email tanya@fairbornchamber.com. https://www.fairborndailyherald.com/wp-content/uploads/sites/50/2019/04/web1_egghunt4.jpgFile photo The horn will sound at 2 p.m. Sunday, April 21, signaling the children to begin the egg hunt, at Central Park, 222 S. Central Ave.
https://www.fairborndailyherald.com/wp-content/uploads/sites/50/2019/04/web1_egghuntkids1.jpgFile photo The horn will sound at 2 p.m. Sunday, April 21, signaling the children to begin the egg hunt, at Central Park, 222 S. Central Ave.